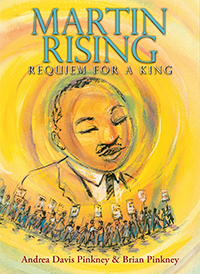 This year's winner is Martin Rising: Requiem for a King by Andrea Davis Pinkney, illustrated by Brian Pinkney (Scholastic Press, an imprint of Scholastic). Andrea Davis Pinkney will accept the award and the $1,000 prize, courtesy of Lee Bennett Hopkins, on Sat., July 13, 2019 at 11:00am at Schlow Centre Region Library near Penn State’s University Park Campus. Andrea Davis Pinkney’s Martin Rising is quite simply a poetic tour de force, perfectly complemented by Brian Pinkney’s ethereal, swirling watercolor illustrations. Though there are volumes written about Martin Luther King, Jr., Martin Rising Requiem for a King offers a fresh voice that features not only his accomplishments, but also reveals his humanity. Each poem could stand alone but when read as a collection the significance and power of this volume is stunning. The marriage of the language and the art results in something that is both elegant and eloquent. Martin Rising: Requiem For a King is a collection of fabulous poems by Andrea Davis Pinkney each of which should be read aloud and savored for their powerful images and wonderful word-play. When they are gathered into this beautiful book featuring the colorful imaginative images of illustrator Brian Pinkney, they become a powerful work of history that tells a story full of empathy and poignant detail about the days leading up to the death of Dr. Martin Luther King, Jr.
​Medina’s tanka poems evoke highly specific and emotionally charged images of the preciousness of Black boys’ lives from varied perspectives. 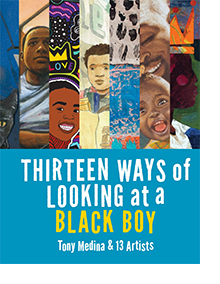 In 13 Ways of Looking at a Black Boy Tony Medina uses the tanka, a less-known poetic form which he explains in the book, to present a variety of snapshots of the lives of young African-Americans. The poems are each illuminated by the work of a different artist and the book is a visual and auditory delight. 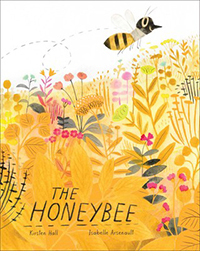 The Honeybee is an outright delight: zippy, breezy, and buzzy, illuminated by stunning illustrations in shades of fluorescent yellow and orange. The language is the “Queen Bee” in this one. It is nothing short of delightful to read aloud (even if you are the only one in the room). The pacing varies like the activity of a worker bee moving through the season and the art is perfectly paired with the language. The bonus is that you leave the last page filled with both delight and new knowledge of honey bees. The Honeybee by Kirsten Hall is rich with word-play, rhythm, and fun that explains the lives of honeybees in a single book-length poem. The illustrations by Isabelle Arsenault are fully a part of the poem as they mix the words into the drawings to add even more energy and buzz to this beautiful book. The Lee Bennett Hopkins Poetry Award is named for the internationally renowned educator, poet, anthologist and passionate advocate of poetry for young people. Established in 1993, the award is presented annually to an American poet or anthologist for the most outstanding new book of poetry for children published in the previous calendar year. Selected by a panel of authors, librarians, teachers and scholars, the Lee Bennett Hopkins Poetry Award was the first award of its kind in the United States. The Pennsylvania Center for the Book, the Penn State University Libraries, and Lee Bennett Hopkins share joint administration of the annual award.